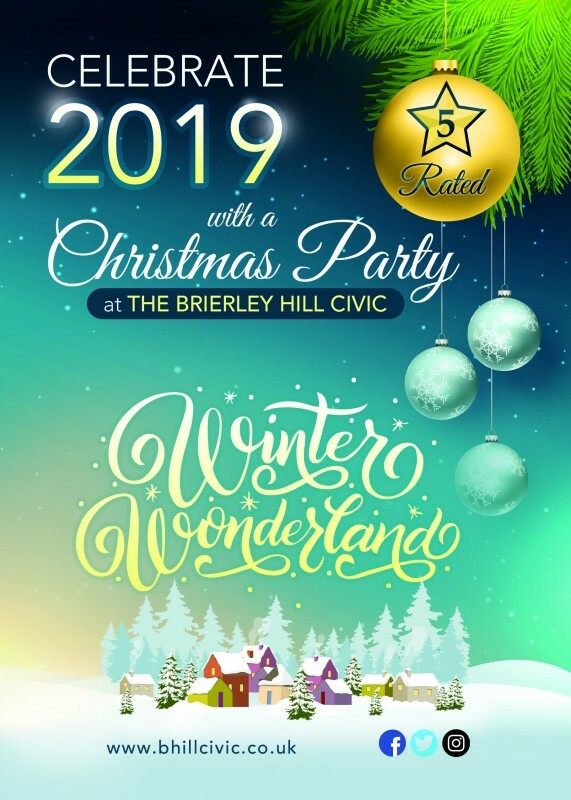 Come and Celebrate 2019 with our 5* Rated 'Winter Wonderland' Christmas Party Nights. If you are planning to celebrate the festivities with a fantastic night out whilst enjoying a delicious 2 Course Meal then look no further. Enjoy a fun Winter themed evening packed with Christmas Cheer. Meet up at 6.30pm for pre dinner drinks, take your seats at 7.15pm with dinner being served at 7.30pm. Dance the night away with our Ultimate DJ until Late*. Roast turkey crown or succulent roast beef served with sage & onion stuffing, sausage wrapped in bacon, selection of seasonal winter vegetables, roast potatoes, new potatoes and gravy. Brie and cranberry puff pastry parcel served with a selection of seasonal winter vegetables, roast potatoes, new potatoes. ‘Vegan nut roast, (vegan, vegetarian, gluten and dairy free.) with a selection of seasonable winter vegetables, roast potatoes, new potatoes with vegetarian and gluten free gravy. New York baked cheesecake, fruits of the forest compote, whipped cream. Profiteroles filled with fresh cream, chocolate sauce drizzle. *Party is on until Midnight on Thursday 19th but and 1am on all other nights. Visit: https://www.facebook.com/BHillCivic/videos/1059778870868729/ for a clip from one of last years parties. **Additional dates available for large private bookings of 150 minimum. Please call the Box Office on 01384 573381 to book or for further information. • Please telephone the Civic to check availability for your chosen dates and to make a personal reservation. • Requrst a booking form via emailing- boxoffice@bhillcivic.co.uk and return it to the Civic with a non-refundable deposit of £10.00 per person for the parties or events, please make cheques payable to Dudley CVS Enterprises Ltd.
• For all parties food orders and the balance of payment must be received no later than 10 working days prior to the event. 1. All verbal bookings will be treated as provisional and will be held for no longer than 14 days pending receipt of written confirmation and the appropriate deposit. 2. Parties: Bookings not paid for in full by 10 working days prior to party will deemed to have been cancelled and any monies paid will be retained by the Civic. No refunds of monies paid will be made for cancellation or decreases in the number of guests attending. Monies paid for non-arrivals are forfeited and cannot be transferred to cover food, drinks or entertainment. 3. The information in this brochure is correct at the time of printing. The Civic reserves the right to amend its prices at any time before booking. Bookings are subject to availability and prices quoted at the time of booking. Except in respect of changes to the rate of VAT, prices will not change once booking has been made. 4. The Civic reserves the right to alter or amend the contents of an event or to cancel an event for any reason, for example if there is a shortfall in the minimum numbers required to operate a programme. In such circumstances, and without affecting your legal rights, you may choose at your sole discretion an alternative date, subject to availability or obtain a full refund from us. 5. All additional charges incurred during the event must be settled prior to departure. 6. All prices are inclusive of VAT. If the general rate of VAT is altered, our prices will be modified accordingly. Gratuities are at the guests’ discretion. 7. Other than for death or personal injury caused by our negligence, our liability to you is limited to the price of your booking plus expenses directly and necessarily incurred by you to comply with your booking. 9. Some of our dishes may contain ingredients which could cause an allergic reaction. Guests subject to allergies must notify the Civic at least 10 working days prior to the event so alternative ingredients or dishes can be arranged. No amendments whatsoever are possible on the night.